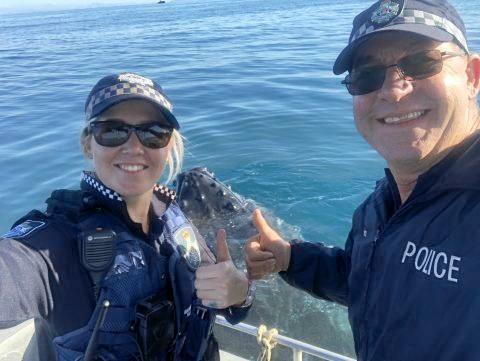 A PAIR of Sarina police officers were given a bit of spray on the weekend- by a playful friendly whale. Sarina Officer-in-Charge Sergeant Mick Jones and Constable Jemma Crowley were on duty on Sunday, patrolling waters around the Hay Point Port and Dalrymple Bay Coal Terminal to ensure both experienced and recreational fishermen were abiding by the exclusion zone rules. Sgt Mick Jones told the Daily Mercury the pair had switched off their engines and were drifting, when the whale breached right beside the boat. "This whale came to check us out and continued to do it for about an hour," he said. "It was almost to a point where it was ho-hum after a while because we got to see every inch of its body... it was amazing. 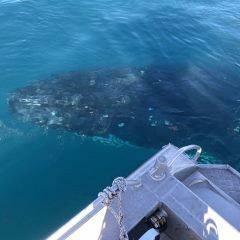 "Rolling on its belly... you could see where a Great White Shark had tried to attack it." "You could look into its eyes, it was doing pirouettes, it would roll over and roll its head up," Sgt Jones said. "It would just stay there, for a few minutes, and then it would roll over and swim away and it would keep coming back." 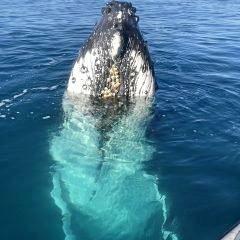 Sgt Jones, a keen fisherman himself, said the whale came so close he could see a couple of whiskers on its chin. "I'm not a marina biologist, but it certainly wasn't as big as they get... I think it was an adolescent," he said. "It was that close you could see a couple of whiskers off its chin. "And the whole time it was around us, flapping and flopping and carrying on, not once did it rush the hull of the boat. "It did not once brush the boat with its belly its back, nothing." The officers took off their heavy kits just in case the whale did get a bit "boisterous" and rocked the boat. Sgt Jones praised the behaviour of other boaties in the water, and said everyone kept a good safe distance.